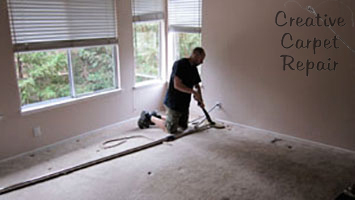 True Carpet Stretching is the installation of carpet using a power stretcher that is on a pole system that has claws that dig into the latex backing of the carpet, and using leverage applies about 674 pounds of force on the carpet. 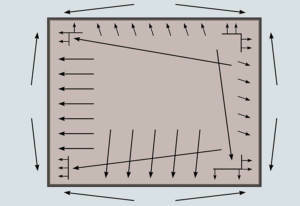 The carpet is Power stretched up to 8 different directions under tension (see diagram to the right), and then under tension is reattached onto the tack strip, then is trimmed and tucked along the perimeter of the room to the sub-floor, usually either concrete or wood. Why did wrinkling or buckling or rippling happen to my carpet?
. This was probably because you went to a big box store who outsources to the lowest bidder and they know you wont see this for 3 to 5 years and so they don’t care and provide no real recourse for this type of installation, which in most cases, violates the carpet manufacture’s warranty. All carpet MUST be installed with a power stretcher. How Much Does Carpet Stretching Cost?. 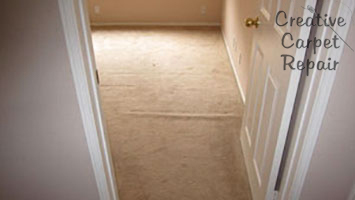 Most carpet stretching runs from $100 to $250 per room. Several factors go into the cost. For example, how large the room is and how much work is needed to do to properly stretch the room. Secondly, is there much furniture required to move around the room to adequately stretch the room or area. Thirdly, are there any seams that need to be broken and re-seamed in order to properly stretch the room, such as in a hallway. Fifthly, are there any irregular shapes, low shelving units, fireplaces that we need to work around or air vents that we need to move after stretching. When you call us, we will give you a good phone guesstimate about what you’re looking at. Then, when our expert arrives, they will give you an exact price based upon what they see there. If you like the price, were coming ready to do the work. If you don’t we will leave empty handed and you wont get the work done. Now, we both don’t want that, do we? Wrinkled carpeting is embarrassing and can be a trip-hazard and become dangerous. Let’s get it fixed. If so, you need to have your carpet stretched back into place before someone gets hurt. 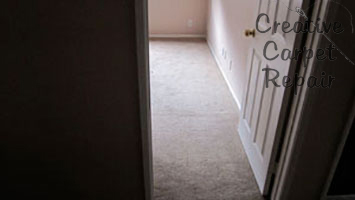 When your carpet has wrinkles or ripples, it’s dangerous and wears out quickly. Carpet is designed to lay flat and tight. When your carpet is loose, it moves as you walk on it. This movement up and down under your feet breaks down the integrity of your carpet and wears it out. Give us a call and we’ll get those wrinkles out lickety split. Carpet Stretching – Get Those Wrinkles Out Today! When you have us stretch your carpet we back it up forever with our 100% Unlimited Unconditional Lifetime Labor Guarantee. We make it easy for you. Just give us a call and if it’s during business hours, we’ll actually answer the phone and give you a phone guesstimate. If you feel that the phone guesstimate is fair, then, we will come to your location and give you an absolutely free, no obligation bid. At that time, if you feel the price is fair we will be ready to stretch your carpet right there and then, all in one trip. 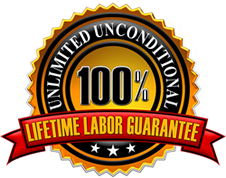 100% unconditional unlimited lifetime labor guarantee. Do you have a lot of furniture to move? This is one strategy we use to stretch a carpet using a power stretcher. Watch this carpet stretching video to get an idea about what we will be doing for you. When can we stretch a carpet without moving the furniture? Normally only when we absolutely necessary and we have no other choice. In this circumstance we can not guarantee the work forever like usual. Watch the video now and you’ll get a good idea how we do it when we have to. This carpet stretch job carpet is in a mobile home. It’s a beautiful light cream color. The only problem is the wave running all the way across the room. A good carpet stretching will fix this room right up. When we stretch carpet, the carpet normally only needs to be stretched one direction. This particular carpet stretching job was a major challenge because the loose carpet was stiff and stubborn. Even with the power carpet stretcher it was difficult. After several stretches I finally got it right. It looks perfect now. When you want to stretch carpet give us a call! The lighting changed while I was stretching this carpet but you can still see that the loose carpet is now tight. To keep your carpet looking it’s best, a good carpet stretch when it has carpet bubbles is the best thing to do. This room needed carpet stretching in several places, you can see the video above how to stretch carpet. In a large room with loose carpet we stretch it with a carpet stretcher. Knee kickers aren’t enough to pull carpet tight in a room this big. This is the same room as the above picture. Do you see the carpet ripples? We stretch carpet every day so when you need carpet stretching give us a call! Here’s Alan using the power stretcher to stretch carpet. The power carpet stretcher is used to stretch carpet in all sizes of rooms but it’s most important in large rooms. The power stretcher reaches all the way across the room. One end butts up against one wall and the other end has a head with a lever.When we push down on the lever, the carpet is stretched. This is a very powerful tool. If we stretch the carpet too much it can rip or pull off the tack strip. Here’s a view of the carpet after stretching. This angle shows where the ripple in the carpet used to be. Nothing is worse for a carpet than to leave it loose. A loose carpet will get looser and more rippled very quickly. When we stretch carpet we help it last far longer. 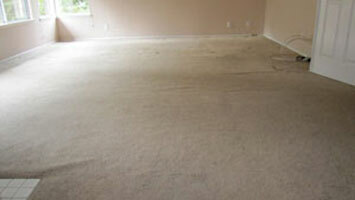 Many times a carpet will become loose due to traffic, cleaning, humidity or a bad original carpet installation. Call us for all your carpet stretching needs. This is a master bedroom with a couple of nasty wrinkles in it. It’s especially important to repair this carpet by pulling the wrinkles out because the lady that lives there is over 80 years-old. She can’t afford to trip over the carpet. This first carpet wrinkle is in front of the bathroom. This second carpet wrinkle is between the bed and the built-in furniture. Using the pole stretcher/power stretcher, we pulled the carpet wrinkles out and then cut off the excess. The carpet is tight here but you can see where the wrinkle left a mark. 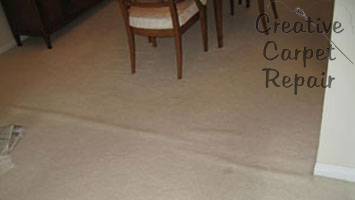 Sometimes the top ridge of a carpet wrinkle can attract dirt. At least the carpet is now flat and safe. 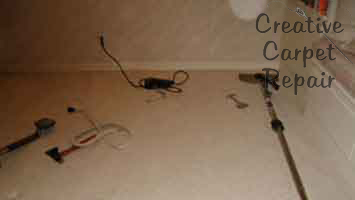 A small carpet wrinkle in a bedroom ruins the look of the room. It’s a small carpet ripple now but if left unfixed it will become a large carpet ripple. The lighting changed while I was stretching this carpet but you can still see that the loose carpet is now tight. To keep your carpet looking it’s best, a good carpet stretch when it has carpet bubbles is the best thing to do. This room needed carpet stretching in several places, you can see the video above how to stretch carpet. In a large room with loose carpet we stretch it with a carpet stretcher. Knee kickers aren’t enough to pull carpet tight in a room this big. This is the same room as the above picture. Do you see the carpet ripples? We stretch carpet every day so when you need carpet stretching give us a call! Here’s Alan using the power stretcher to stretch carpet. The power carpet stretcher is used to stretch carpet in all sizes of rooms but it’s most important in large rooms. The power stretcher reaches all the way across the room. One end butts up against one wall and the other end has a head with a lever. When we push down on the lever, the carpet is stretched. This is a very powerful tool. If we stretch the carpet too much it can rip or pull off the tack strip. This angle shows where the ripple in the carpet used to be. Nothing is worse for a carpet than to leave it loose. A loose carpet will get looser and more rippled very quickly. When we stretch carpet we help it last far longer. The carpet is tight here too but you can see where the wrinkle left a mark. 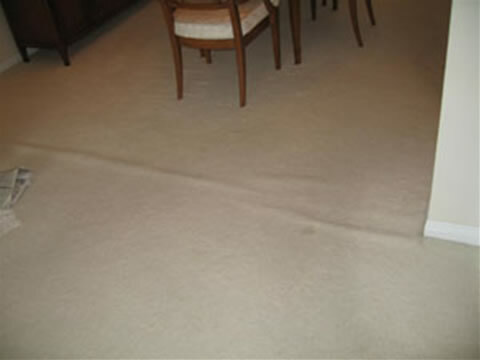 Sometimes the top ridge of a carpet wrinkle can attract dirt. At least the carpet is now flat and safe. Here you can see that the carpet is now tight. DIY carpet stretching – Do you really need to hire a professional? Steve has created a number of carpet repair videos, including some about carpet stretching, so feel free to review the three carpet repair videos on this page. Our carpet stretching prices are competetive and fair, but we understand that many homeowners have little money to spare. We offer this information about DIY carpet repair so that you can get an idea of the tools you need to eliminate the ripples, bulges, and wrinkles that make carpet unsightly and dangerous. 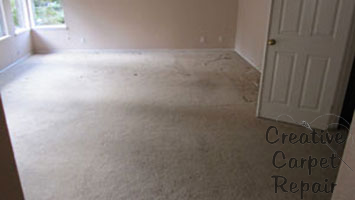 Remember, you can get a free estimate just by picking up the phone and giving us a call at 800-656-9862, so before you start moving the furniture, why not find out how affordable a professional carpet repair can be? 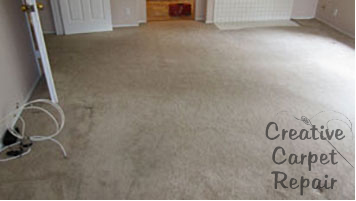 Carpet stretching is necessary when wrinkles, bulges, or waves form in carpet. Carpets may become loose for a variety of reasons including heavy traffic, cleaning, humidity, dragging furniture across the floor, or poor original installation. When done right, carpet stretching maintains the shape of the carpet. Most of the time, it’s only necessary to stretch a carpet in one direction to fix the problem. Depending on the size and severity of the wrinkles, your carpet repair expert may use a variety of tools and techniques to fix the issue. 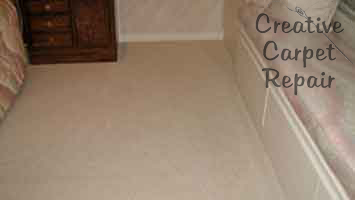 Wrinkles, ripples, and bulges can be removed from any* carpeted room in your home, even long hallways. 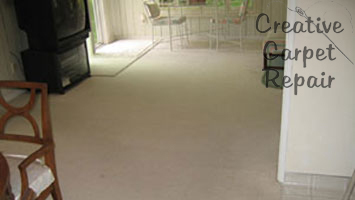 * The only kind of carpet that is not always stretchable is carpet that has been glued down. Sometimes, and we mean sometimes, the glue can become less sticky and wrinkles can be removed but not always. The kneeless carpet stretcher (kicker) is a handheld device that works well for smaller problems along carpet edges. This tool uses good, old-fashioned knee power to help finish off the work done by the power stretcher. The carpet power stretcher is an essential carpet stretching tool. If your carpet was installed with a carpet stretcher, it will eventually buckle. This tool is a large pole that can extend across the entire length of the room. It braces against a wall, and a lever pushes carpet toward the opposite end of the room, pulling it tight. 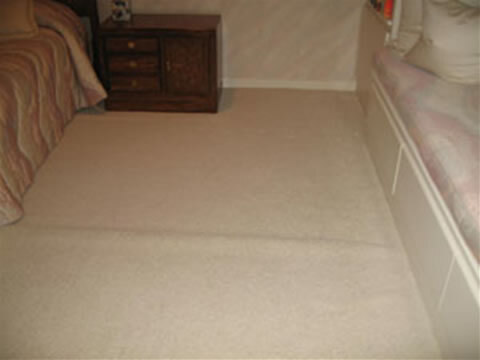 We use a carpet power stretcher because it guarantees the carpet will not become rippled again at a later time. 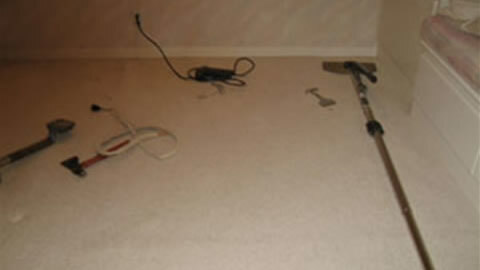 Most carpet wrinkling problems are the result of this tool not being used, or being misused. 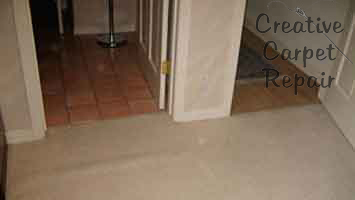 Once the carpet is stretched, a Slotted Blade/Carpet Knife is used to trim excess material. This carpet is trimmed before the main section is reattached to the subfloor. Once your carpet stretching job is done, you won’t be able to notice that there was ever a problem. 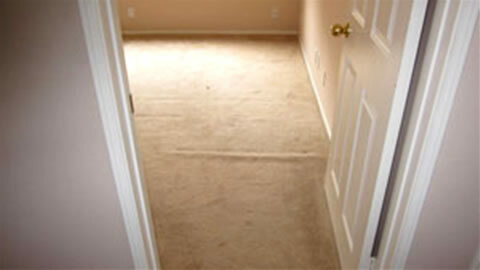 Stretched carpet dramatically improves the look of any room, and can save you thousands of dollars when compared to replacement. An Industrial carpet staple gun uses a narrow staple that fits between the carpet nap. For carpet stretching jobs, the carpet staple gun is used to reinforce the tack strip with necessary. If you’re attempting a DIY carpet stretching job, you will also need a Hammer and Awl for working with the tack strip. We recommend moving furniture before stretching the carpet in the room. We can provide you with useful information to make this happen, and can even offer assistance moving your furniture if you need it. Sometimes heavy items like a piano or large king-sized bed are a tremendous hassle to move, but we can usually stretch carpet underneath of heavy items, although it will cost more because it is time consuming. Fortunately, there is no risk in finding out whether your carpet can be stretched without moving your furniture, so call us today for more information. 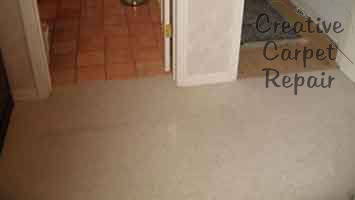 Call a carpet stretching expert for a free estimate and enjoy our 100% Unlimited Unconditional Lifetime Labor Guarantee Creative Carpet Repair does something no other carpet repair company even attempts to do. If you understand the value of reliable customer care, free estimates, and quality workmanship backed up by an unconditional labor guarantee, then give us a call. 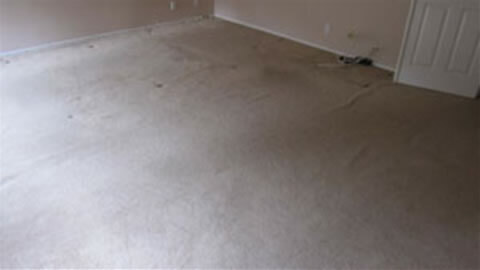 Poor installation – If your carpet is improperly installed (due to insufficient or nonexistent stretching, or improperly securing the carpet), it may need to be re-stretched as a carpet repair. Heavy traffic – If your carpet gets heavy traffic beyond normal foot travel (such as walkers or wheelchairs, tricycles, etc. ), it may eventually come loose, even if it was installed perfectly. Moving heavy furniture – Sliding heavy furniture across your carpet can cause its layers to ripple and leave the carpet loose and buckled. 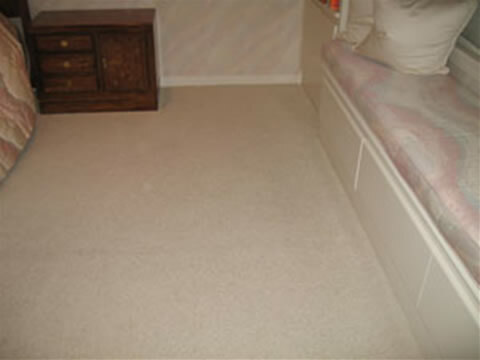 Wrong pairing of carpet with padding – Different types of carpet pile are meant to be used with specific types of carpet padding, so the carpet is properly secured and supported. The manufacturer’s guide or an experienced professional can help you ensure you have a proper match before your install your carpet; otherwise, you may deal with ripples later. 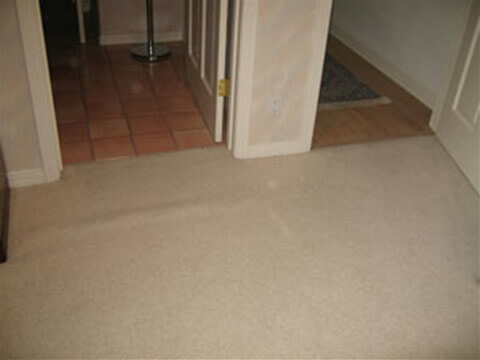 Delamination – This means the latex that keeps the carpet backing intact has deteriorating; the carpet may start to fall apart by losing fiber or rippling. Once your carpet starts to ripple, it’ll keep getting worse. Because carpet is intended to lay flat at all times. a small ripple not only puts more wear and tear on the carpet and causes it to move when you walk across it. That movement causes…you guessed it…more ripples. Soon your carpet will begin to look more like an ocean than a floor, and that’s a problem. “Oh goodie,” we can hear you thinking. If you find yourself in this situation, don’t worry. You probably won’t need to replace the carpet. 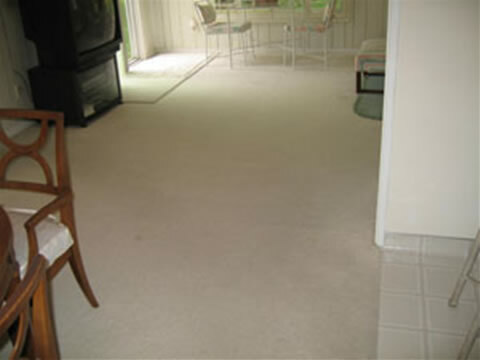 For the most part, stretching carpet will remove the buckles and return it to a flat, attractive floor covering. 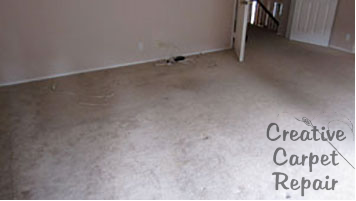 Carpet stretching is a very common carpet repair task. Carpet stretching is simple in theory: it involves pulling up the edges of the carpet, re-stretching the carpet so it’s properly taut, trimming any excess that’s been created, and re-securing the carpet in its new place. But in practice, it’s a considerably involved process, involving unique tools and proper technique to accomplish a successful carpet stretch. If you decide to attempt carpet stretching on your own, the following tools will be essential; if you don’t own them, most should be available to buy or rent, and aren’t too expensive. A professional carpet repair person will have all of these tools (and probably more) on hand; hiring out your carpet repair to a seasoned veteran is still more affordable than replacing it with new carpet, so whether you try it yourself or pay someone (Us, please!) to do it for you, these tools are cost-savers. Slotted blade knife or carpet knife: This knife will play a role in almost every carpet repair job imaginable. When you stretch a carpet, the carpet knife allows you to remove spare carpet created around the edge after the carpet is stretched tight. Kicker/knee stretcher: A sort of mini version of the power carpet stretcher, the knee stretcher uses leg-power to help finish off, around the edges, the work that the power stretcher does. Industrial carpet staple gun: This isn’t your grandparents’ staple gun (unless your grandparents repair carpet). Designed with a much narrower staple that fits between the carpet nap, a carpet staple gun is always a good tool to have at the ready. It’s not required in carpet stretching, but because the carpet gets so tight, the tack strip may need some assistance in assuring the carpet is without-a-doubt secure. The staple gun is that assistance. Awl: An awl helps you detach carpet from the tack strip; it looks something like an ice pick. It’s simple and very helpful for what it does. Hammer: Always a good idea. If you don’t have a hammer around, carpet stretching is probably not something you’re prepared to do. Below you’ll find a very simplified version of the basic steps of carpet stretching; it’s by no means the step-by-step guide. If you don’t know how to do this properly, I strongly advise that you hire a pro. If you do decide to go ahead, work slowly, use your head, and above all—be very careful. Before carpet stretching can even begin, you need to know how tight it’s supposed to be. When a manufacturer makes carpet, they specify not only the type of padding that should be used with it, but how tight it should be stretched. For example, tufted carpet with a backing made of synthetic fiber shouldn’t be pulled as tight as a similar carpet with jute backing. 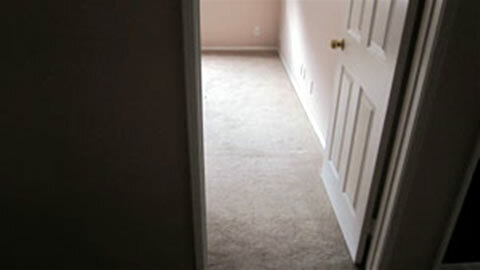 Stretching carpet to the wrong tightness can damage the carpet. If you have the tools and know how tight you need to stretch the carpet, then you’re ready to embark on the carpet stretching journey, as outlined below. Click here to learn how to stretch your own carpet.